The idea first took shape on a napkin. 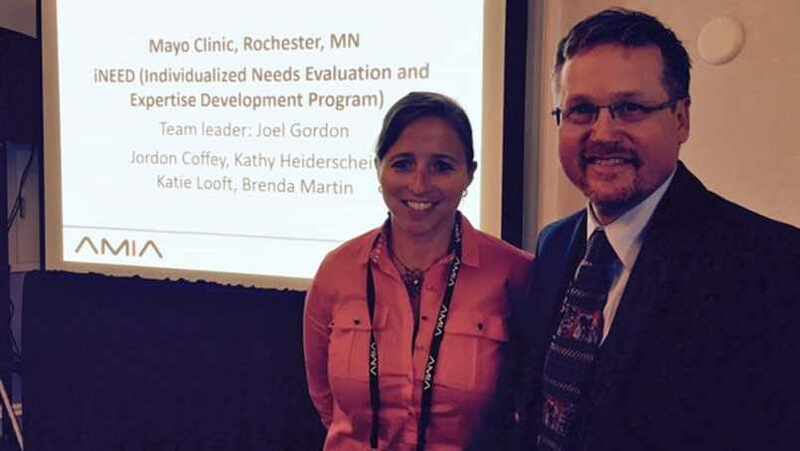 Joel Gordon, M.D., a Family Medicine physician at Mayo Clinic Health System in Mankato, had been troubled by the fact that with all the certifications at Mayo, there was no way for care providers like himself to be certified in their knowledge and use of Mayo's electronic health record. So after giving it some thought, Dr. Gordon came up with an idea for a software program that would allow doctors to go through what he calls "electronic health record gymnastics" to pinpoint what they know, and don't know, about using Mayo's electronic medical record. "At the time, we'd deploy computers into clinical exam rooms and make these greatly complex computerized workflows that were meant to safely change how we do things," he tells us. "But they'd be done in classroom settings, where it would be very hard to translate what was being learned to clinical settings without making huge disruptions to the workflow." That was four years ago. Today, that napkin-based brainstorm has turned into iNEED, a "unique, systematic, and individualized" certification tool that helps care providers improve their proficiency with Mayo's electronic health record. Dr. Gordon says it took a team effort to build and deploy this program, including colleagues from Resources Training and Development and the Office of Information and Knowledge Management, along with the support of leadership and the input of patient care providers, to make the project a success. Using iNEED, providers go through 22 simulated patients in about two hours, Dr. Gordon says. The program measures how they do and identifies "when they're outside of best practices and Mayo's patient care goals." Care providers are given a report card and additional training tailored to address any weak spots. The training assessments help ensure that any errors in the record are prevented before they begin. And, "the assessments and evaluations are done in a way that's consistent with all the other certifications that a physician has to do at Mayo Clinic," he says. The other nice thing about iNEED, Dr. Gordon says, is how it's being received. "We do a reflection each time after providers go through the experience, and so far 98 percent have said that it was worth their time and that they recommend others do it, too," he says. The program has also been well-received by the National American Medical Informatics Association, which named it "Runner Up" for the Physician Innovation in Informatics Award (or Pi2), also known as the Pie Award, (the winner gets a year of gourmet pie along with bragging rights, we happened to note) this past May. You can learn more about iNEED by watching the YouTube video below. Then, skip on down to share your comments and share this story with others. I started at MCHS in La Crosse 1 year ago. The iNeed program was starting 6 months later. I was asked to go through the iNeed program as a tester. I am not a Provider but I did it because I thought it would be a good learning opportunity for me as I was learning Cerner at that time and it would help the staff working with the program to do some testing of the program. It was very helpful for me and I know many Providers who have gone through the program and have really been happy with all the things they have learned from the experience. It is an excellent program! !